PixPulse is a mobile media publishing platform for sharing photos, videos and blogs. You can get a free channel, create your own mobile media blog and share it on phones and the web. 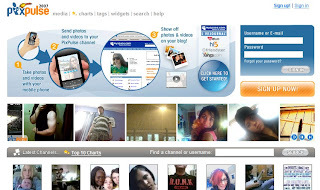 You can use your cell phone to take pictures or videos, and send them to your channel, you also can put them with PixPulse widgets on Myspace or blog. It is a mobile media community, you can meet many friends there.